The pommel is divided into five sections as sharply partitioned tongues, [which are] completely separated at the top with the outermost [tongues] protruding outwards at an angle. This is in contrast to type K, which was its precursor and from which in some instances it can be difficult to distinguish, just like previously emphasized under this type. In the genuine [O] types the guards are slightly curved. I divide the type into three groups, of which the first two groups are sharply distinguishable from type K.
C 13848 a. Berg, Løiten, Hed. C 2710. Tanum, Lardal, J.L. A 288. Hanerød, Øiestad, Ned. A 302. Soteland, Holme, L.M. B 4385. Rossebø by Haugesund, Stav. B 1103. Dukstad, Vangen s.Voss, S.B. B 690. Vangsnes, Balestrand, N.B. T 6292. Opdal or Ørlandet, S.T. T 3845. Stamnes, Beitstaden, N.T. C 10551. Fevig, Fjære, Ned. B 5110. Rekdal, Fiksdal s.Vestnes, Rmsd. Partly, just like with the two previous groups, here there is also placed twisted silver or bronze thread in between the tongues and in between the pommel and the upper guard, just like we heard of under type K.
[Group] II. The second group (fig.105) is of a similar shape, but the guards are made of iron with a cover of silver plates. [The silver plates are] decorated with animal ornamentation and with a more ordinary twined band. I also include under this type detached guards with the same shape. This can however be a little doubtful, if not from the standpoint of the Norwegian material, but rather when one  examines the sword pictured in Montelius: Kulturgeschichte Schwedens p.263 fig. 422 from Södermanland. This is without doubt quite a different type with respect to the pommel, while the guards are similar or equal to the guards in type O. Those swords where only the guards are preserved, not the pommel, will be marked by a "x" in the inventory list. The guards are distinguishable from swords of the R-type in that the end sections of the guards in the last type are widened both underneath and above. C 16381. Gunnarsby, Rygge, Sml. T 5982. Jystad, Børseskogn, S.T. (pictured Ab. 1900 p.266 fig.A). Hereof, only four have their pommels preserved, and it is therefore possible that the number in reality must be reduced. We shall also immediately note that there is only a difference in nuances between this group and the next. All blades are double-edged. 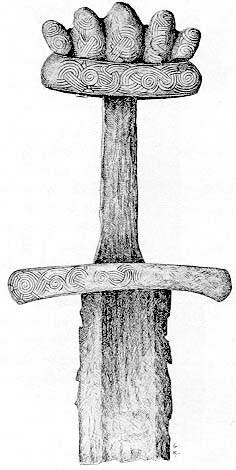 One of the swords (C 16380) has an Ulfberht-inscription, and a couple of others have damascened marks. C 6861. Drognes, Nes, Akh. C 11591. Kamfjord, Sandeherred, J.L. B 6700. Gjersvik, Tysnes, S.B. B 5730. Myklebostad, Eid, N.B. B 6735. Saarheim, Gloppen, N.B. B 6358. Ytterdal, Norddalen, Rmsd. C 3945. Indre Strand, Vanelven, Rmsd. C 9224. Stokke, Sunnelven, Rmsd. Possibly, C 7900 from Midt-Strand, N. Aurdal, Krist. also belongs to this group, but here the middle section is thickened, even if the guards are low and it otherwise reminds us of group III. There is a clear kinship between the last group and individual specimens of type K. It might seem artificial to create a distinction based on whether the tongues [on the pommels] are standing straight up or protruding to the sides and if there is a larger or smaller division between the individual tongues. I have nevertheless made a distinction and believe there is a difference in time between these types. The first, which had as its origin swords like T 453 from Gravraak in Melhus (fig. 89), appeared in the first half of the 9th century. It can be found in its further stage of development in the second half of the 9th century, and has most likely developed further in the O-type, which primarily belongs to the 10th century. This is how I view the development, and I shall now use the find-combinations in an attempt to show how I gained this understanding. It is not at all my belief that the development has taken place in this country [Norway] like I argued was the case with the development of the B-type into the C-type. It is also clear that type O is foreign just like type K, at least foreign in its origin. But I think it is evident that there is a connection  between the types, a similarity that consists of the five-lobed pommel, separated into five quite uniform tongues. Fig. 107. Saarheim, Gloppen, N. B. a ca. 1/2, b ca. 1/4, c ca. 1/3. When looking at the find-combinations we shall consider them group by group. If we first look at group I, we have find C 13848 ff. from Berg, Løiten, where there is an axe-blade of the E-type, a rattle of the traditional type with a handle, but with circular round rings, and finally a double oval bronze buckle like in R 652. Thereafter we have find B 2816 ff. from Jevnaker, where there is an axe of the transitional type between the A and the H-I type, an arrow point most likely of the C-type and a shield boss with a little ledge. Finally, we have find C 2708 ff. from Tanum, Lardal, J.L., where the axe blade seems to be of a kind of H-type (it is however badly rusted). The arrow point makes an exceedingly slim impression and the shield boss is low. From this it appears evident that the first two finds most likely must be referred to about 900. The axe blade signifies an earlier time period, while the oval buckle suggests a later time period. The rattle indicates the transitional period exactly. Likewise B 2816 gives the impression of belonging to the earlier finds. It seems both the spear point and the axe blade must be referred to the second half of the 9th century. In the "Osebergfundet I" (inventory over Norwegian ship graves, p.16), Schetelig dates find B 690 ff. to the 9th century, based on an Irish piece of armature. In the whole, group I seems to make a somewhat earlier impression within the type. In group II we first have find C 16380 ff. from Gunnarsby in Rygge. Here we find spear points of the I-type and other slender spear points. Thereafter, C 13458 ff. from Allum, Hedrum, where we again have spear points of the C-type, axe blades of the E-type and a rattle of the transitional type with round rings and handles. In addition the stirrups were of a later type, and the shield bosses were all low. Following, we have C 13618 from S.Farmen, Hedrum, where there is a spear point of the slender type with a high ridged blade. We shall here insert find B 5161 ff. from Nes, Hammerø, Nordland, which according to plan, was not included in the inventory over the finds. In this find there was an axe of the E-type with a particularly thin blade and also a sword of the X-type. Furthermore, we have B 6617 from Gryten, Borgund (the sword that Schetelig, as mentioned, dates to the second half of the 10th century and as such in strong contrast to B 690 - the date determination is weakened by a mistake in the type reference - as such in strong contrast to B 690), where there is an axe blade probably of the E-type. Finally we have T 5982 ff. from Jystad, Børseskogen, where there is a spear point of the transitional F-type. The time period for this group will be about the same as the previous; it first appeared probably around the 900s or possibly a little earlier, but belongs primarily to the 10th century. 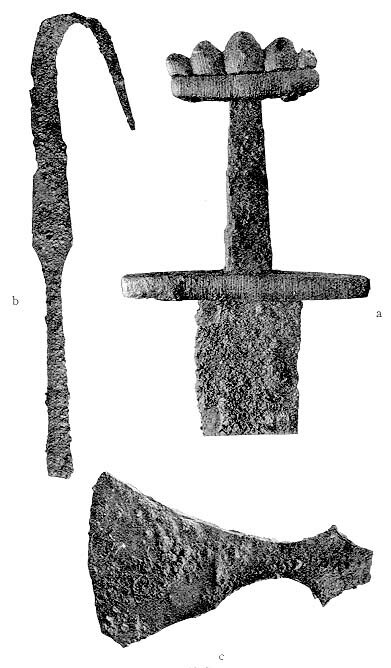 The Ulfberht-sword from Rygge suggests a later time period; the axe blades of the E-type and the spear point of the C-type surely indicates an earlier time period. The group extends most probably into the middle of the century, but apparently not any later. In group III we have C 6861, somewhat diverging with [its] larger guards, but otherwise belonging to the same main category. It is found together with a spear point of the pronounced slender, high ridged type. In B 5730 from Myklebostad, Eid, N.B. the spear point is also slender, of the I-type  and the axe blade is closest in resemblance to the G-H- type. Next we have B 6735 from Saarheim, Gloppen (fig. 107) with an axe blade of the E-type and a spear point of the F-type. Here an arrowhead makes an absolute later impression. Finally, we have the two finds from Søndmøre C 3945 and C 9224 from Vanelven and Sunnelven. The first is found together with an axe of the H-type and a spear point most likely of the D-type, the other with a spear point probably of the F-type. This group is also best dated to the same time period as the two previous [groups], namely the first half of the 10th century. There was an Ulfberht-sword here as well that indicates a later time period. The whole O-type possibly follows directly after the K-type at the end of the 9th century, and belongs particularly to the first half of the 10th century. I now know the type in altogether 39 specimens in this country, whereof probably two of them are uncertain. The first group is evenly distributed basically over the whole country. The second group is more of a coastal group, relatively unevenly distributed, but with only one specimen from the inland region of Ringerike (C 598); but this is not entirely certain. The last group is quite a coastal group whereof an entire five specimens are concentrated around Nordfjord and Søndmøre. There is no doubt that this type, in its origin, is a foreign type. 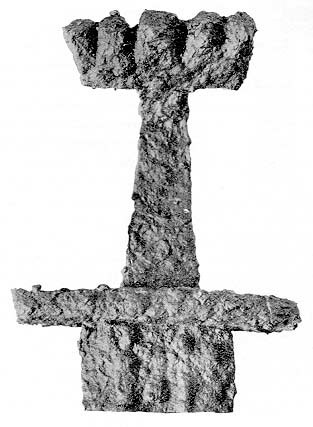 First, the two swords with the Ulfberht-inscription point hereto. Thereafter, the remarkable ornamentation, especially on the hilts and pommels of the first group. Otherwise I know the type in foreign literature only from Schleswig, where we have two specimens. On one of these there is band ornamentation, exactly like the sword A 302 from Soteland, Holme, L.M. The five-lobed pommels seemed to present in the west according to notes by Gustafson and Schetelig. It does not however, seem as if they are very similar. On the specimen in British Museum that Gustafson has sketched, the guards are strongly curved, or the middle section of the pommel is wider like in C 6861 from Drognes in Nes, Akh. or B 5730 from Nordfjord. 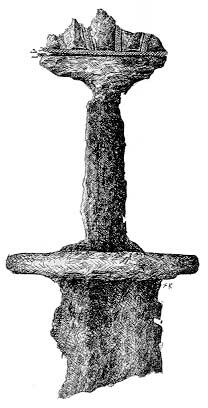 I have also found a sword-pommel and a sword-hilt of this type in Sweden (Inv.-nr. 3217: 52 and 12529 in Statens Historiska Museum [National Historical Museum]). If one looks at the external shape, it is evident that there is a kinship between group I and group II. There also seem to be similarities in the ornamentation and likewise in the patterns that are found on the pommel of the sword C 13458 from Allum in Hedrum and on swords such as R 507 or C 13848 from Berg in  Løiten. The band-ornamentation on bronze hilts such as A 302 seems to be different from that found for example on T 5982 (Ab. 1900 p. 266 fig A) or C 16380; the latter one being of a less simple kind and has a closer relationship to R 504. The ornamentation of the last group is, as mentioned, quite simple, consisting of plain stripes. 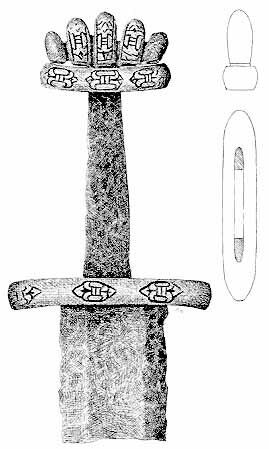 The aforementioned sword from Hammerø shows a somewhat richer ornamentation, where the stripes are branched in a similar fashion to individual swords of the I-type, or as we shall hear, of the P-type. Possibly this also shows a connection in time to these types, at least with the latter. The first of these two swords was found together with two slender high-ridged arrow heads, a circumstance that brings the swords into agreement with the type overall. There is no reason to believe that these two swords are so much younger than the others of type O; we heard that there were swords of type B and C in the same find.